Recently, as part of a larger project, I had occasion to dig into the WPF TreeView control. I followed what I think is the standard development process: read over some sections in my WPF books, and then went online hunting for code. As I got farther into my particular requirements and implementation, I bumped into some gnarly issues that other people were also struggling with. Some of these problems required just an "aha" moment or online tip to solve, while others sent me off into the wilderness for days. Eventually, the code got smaller and simpler, and I decided that it would be useful to give what I learned back to the community. This is the first of two articles describing how I got the TreeView to update and sort and lazy load just the way I wanted. Part 2 of this series is available here. Color code the folders so that "hot-spots" jump out: red for the larger "hot" areas of usage; blue to represent "cold" or relatively small areas, etc. Provide sorting and filtering tools to make it easy to locate problem areas. In the screenshot below, the top level (Drive1) is sorted alphabetically while the second level (DirEe116) is sorted by size. Also, although it's really an implicit user requirement, I need the tree to handle updates such as adding a new directory, deleting one, changing the size, etc. Many of the TreeView examples I looked at were display only, and I ended up spending significant time getting update to work. I should also point out that I didn't consider using a third party component or GUI builder - WPF TreeView was it for me. As I began searching around for code to steal, I found several useful directory tree examples on Code Project. Sacha Barber's A Simple WPF Explorer Tree is a good, straightforward example of what I needed to do. Then I happened upon Josh Smith's great article Simplifying the WPF TreeView by Using the ViewModel Pattern. Josh's work was incredibly helpful, and much of what I do here is derived from his approach. "View" is the WPF framework, and is treated like a black box. Model is the application domain data model and logic, and shouldn't depend on (or know about) WPF. The "View/Model" is an adaptor layer that interfaces the other two. This approach keeps the application side cleaner and more focused, and provides at least some flexibility to port to a different framework later on. Serve as the abstract base class for all of the domain objects displayed in the TreeView. Represent the tree hierarchy by maintaining a collection of children nodes, and a reference to the parent node. This collection of children serves two masters: the HierarchicalDataTemplate that binds to it, as well as the various tree traversal algorithms. Provide the "IsExpanded" property that binds to the corresponding TVI property (Selection is sometimes included here, but I moved it out to a separate class). Provide the implementation for INotifyPropertyChanged, both for the IsExpanded property, and for any properties in derived classes. Provide a way to delete individual nodes or entire sub-trees. Enable deferred or "lazy" loading such that a node's children aren't created until the user requests them. I don't really have a separate application data model (other than TreeNode subclasses), so it's most convenient for me to store the tree hierarchy directly in the ViewModel. If I was getting the hierarchy from existing application data structures, then I would probably need a different ViewModel. The following sections walk through the implementation of the TreeNode class. // List of my children. This is fairly typical for a ViewModel class. ObservableCollection is the recommended choice for collections that are a binding target, and INotifyPropertyChanged is needed to allow the UI to update. to give WPF hints that it needs to update the TreeView; IEditableObject is needed for the same reason. These issues are explored in detail below. In most of the TreeView examples that I looked at, and in my earlier implementations, the children collection is allocated in the constructor. It appeared that the binding from ItemSource to Children locked down the collection such that any attempt to reassign the children reference later would either display old results or throw an exception. The reason for this became clearer once I began creating the ListCollectionView explicitly. The WPF collection view holds a reference to the children collection, so you can't just swap another collection in underneath it. That's most unfortunate because it is extremely inefficient to create a children collection for every TreeNode. If you imagine a tree with 200 nodes, probably no more that 10 or 20 get expanded, and many others are just leafs with no children. So around ninety percent of the children collection objects that get allocated are never needed or used. // I'm a child of my parent. This is just connecting up the tree structure. ConditionActualChildren is also called during lazy loading to ensure that a particular node has a unique collection to add its children to. But I'm not handling lazy loading here: all this logic does is to avoid allocating unnecessary collections, which is a good thing. Also, I want to point out that I'm calling a virtual function inside the constructor. This is considered bad form because we're selecting a method at run time before the object is fully baked. For example, the Visual Studio Code Analyzer (the nagger) reports a 2214 warning and says "fix it." It's safe in this case because the overridden functions are closely coordinated with TreeNode, so I left it this way. Data Binding is a really nice idea. You define a relationship between your data and the UI system, and the binding engine propagates changes back and fourth. But sometimes it doesn't work as expected, and either throws an exception or doesn't update, which was the problem I had. Once I had a working TreeNode implemented, I populated the TreeView using System.IO calls to query the hard drive directory structure. DirectoryInfo.GetDirectories() politely returns the directories in alphabetical order, so I didn't realize that my tree wasn't really sorted. As soon as I implemented test functionality to rename or delete or add a directory (to simulate an update notification from a FileWatcher, for example), this problem became clear. After searching online and rereading my WPF books, I realized that I needed to tell the ListCollectionView what to sort. The first approach that I tried was to create the SortDescriptons in XAML, and hook them up to the view using CollectionViewSource. To do this, ItemsSource first binds to the view, and then the view binds to the children collection. But there is a different collection under every tree node, so this method breaks down (see Bea Stollnitz's article here and the discussion under response number five for a detailed explanation of this). Well, this turned out to be necessary but not sufficient: there were still times when the tree wasn't sorted. As I searched through the blogs, I read several complaints about the TreeView not updating in response to model changes. This was discouraging, since I thought the whole point of data binding was to take this update problem out of our hands. It turned out that what the TreeView needed was a little more notification. Even with these changes, I have to call view.Refresh() whenever a TreeNode expands, in order to trigger the sort, but this is the only refresh call I needed. Really, sometimes I feel like WPF is just toying with me - is it supposed to be this hard? But with these changes, the TreeView stays gloriously up to date at all times. It sorts, it deletes, it slices and dices. I gather that this is somewhat of an abuse of IEditableObject, and that a future release of WPF may provide a better solution. But in the mean time, this was just the hack I was looking for. So far, I've described how TreeNode implements requirements one and two (abstract base class and hierarchy structure), along with a side trip into view management and updating. The code for the next two requirements, the IsExpanded property and INotifyPropertyChanged implementation, was lifted pretty directly from Josh Smith's code, except for changes to deferred loading; refer to the source and the next section. OnDestruct is another virtual notification function that gives derived classes a chance to free up resources. And, the foreach loop is an example of using the Children collection to perform a tree traversal. In many cases, it isn't practical to populate a tree (or list) control with all possible data, so a demand based approach is used. This becomes a ViewModel (or WPF adaptor) issue because if a TreeViewItem doesn't find any children, WPF won't display its '+' expander, and thus the user can't get to the next level. Subclassing the TreeView seemed like overkill to me, so I took the second approach. At the same time, I was reluctant to add more code to the TreeNode class, which is already complicated enough. So I ended up putting the lazy loading functionality in a subclass of TreeNode called TreeNodeLL. There are several interesting aspects to this solution (see the listing below). First, I declared TreeNodeLL internal to TreeNode because it needs direct access to the hierarchy state variables. And, TreePlaceholderChild, the class for the placeholder object, is internal to TreeNodeLL. This is just to restrict its visibility, but since the children collection in TreeNode is strongly typed, the placeholder class must derive from it. The ability to swap out the children collection after binding is very important here as well. Rather than adding and removing placeholder objects all the time, the static constructor sets up a single placeholder list and view that are then shared by all of the childless tree nodes. You can also see that TreeNodeLL overrides the Children property to return an empty list rather than the placeholder list. This ensures that a tree traversal of a node with no children gets an empty list. The logic to reference the placeholder collection, and to create a new collection when needed, is in the two function overrides ConditionSentinalChildren and ConditionActualChildren. These functions are quite similar to the corresponding functions in TreeNode. TreeNode and TreeNodeLL are tightly coupled classes by design. I would prefer that TreeNodeLL be a separate class granted 'friend' access to TreeNode, but C# doesn't support friend access. Also, you can always merge the lazy loading logic back into TreeNode to reduce this back to a single class. But by having two classes, you can choose whether to enable deferred loading by which class, TreeNode or TreeNodeLazy, that you inherit from. And, it allows the interesting possibility of mixing both policies in the same tree, which I leave as an (ahem) exercise for the reader. As I briefly mentioned above, when I first got the directory hierarchy to display in the TreeView, I thought I was done with it. Later, when I started working on getting it to update in response to changes to the underlying file system, I hit a wall. This was before I discovered IEditableObject or how to manipulate the view. At that point, additions to the TreeView always displayed at the end of the list rather than in sorted position, and some other updates didn't work at all. I don't remember my exact reasoning, but in desperation I finally decided that hierarchical data binding was the problem (it was late). By gum, if that tree won't update, I'll just get down and dirty with it. So I switched over to simple data binding, and introduced a new class derived from TreeNode to manage the Items collections within TreeViewItems. At first it seemed easy: maintain a link between my TreeNodes and WPF's TreeViewItems, and just copy my children into Items, which unlike ItemsSource, you can manipulate from code. This involves using the ItemContainerGenerator to look up TreeViewItems, and because WPF creates them at odd times, you have to listen for status changed events. One good thing about this, besides a deeper understanding of the TreeView, was that the placeholder could be a simple object added in to Items; I didn't have to pollute the children collection with it. If you find yourself hooking the ItemContainerGenerator's StatusChanged event so that you can access a TreeViewItem's child items when they are eventually created, you are way off track! Trust me; it does not have to be so ugly and difficult. There is a better way! Amen, brother, I learned my lesson. Actually I didn't even understand what Josh was talking about the first time I read that. Now, unfortunately, I do. But this failed experiment motivated me to go back to basics and get a stripped down sample working, and to write an article about it. The heavily evolved TreeNode class that I ended up with is a bit ugly and non-intuitive, but after all, the whole purpose of an adaptor class is to isolate this sort of plumbing. These two TreeNode classes end up at about 250 lines to satisfy all six of our requirements. In Tuning up the TreeView - Part 2, I'm going to show how we can build on TreeNode to put together a small sample application. I've included this sample project here so you can see TreeNode in context. The sample implements the sorting I described above in the problem section, as well as deferred loading and the CRUD operations. One of my biggest mistakes was not implementing the four CRUD operations - Create, Read, Update, and Delete - early on. These basic operations, along with sorting, will immediately expose any problems you have in an implementation. Getting them to work was not so easy in my case, but having them done provides a solid foundation to build on. I really hope that this stuff is useful to other WPF programmers. I couldn't even get to first base with WPF without great online code repositories like CodeProject. I worked out some of this implementation during the process of preparing this article, so writing for CodeProject actually improved my design. Please tell me what you think, especially if there are better solutions to these issues. Lee has worked on user interfaces, graphics, computational geometry, memory management, threading, and assorted applications in C#, Java, C++, and C. He started out programming in Fortran on a 128 Kb PDP/11, which only proves that he's old, not smart. 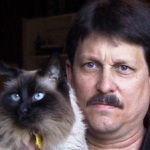 Lee also writes about chronic illness and his love of animals; his auto racing related articles are here. Very nice. Not sure who's responsible for this posting, the cat or the dude in the picture. "But by having two classes, you can choose whether to enable deferred loading by which class, TreeNode or TreeNodeLazy, that you inherit from. And, it allows the interesting possibility of mixing both policies in the same tree, which I leave as an (ahem) exercise for the reader." I've done a few WinForm implementations of lazy treeviews, but didn't ever see a need for two separate node classes to support both policies. In my implementations, the presence of a placeholder child node indicates if the parent node generates its children on demand (the first time it is expanded). The logic that controls it is just a test for the existence of the special 'placeholder' TreeNode-based class. If the first time the node is expanding, the placeholder node is present, the expanding node is instructed to create its child nodes. If some nodes want to create their chidren when they're added to the tree, they're free to do that in their constructor, or by the ViewModel if one is used and handles node creation. In the lazy node implementation's i've done, a virtual bool property is exposed, that requires the node to return true if it has any children (before they are created). The treeview uses it to decide if it needs to add the placeholder node. In any case, I'm wondering if you have noticed the same type of problems that exist in the WinForms treeview that wraps the Windows common control TreeView. The main problem is that when a WinForms treeview with a very large number of nodes (say 100,000) has even just a handful of nodes added to it, it results in an extremely long delay (with BeginUpdate()/EndUpdate() used). That problem seriously hinders the 'lazy' node creation policy. I suppose it is because the nodes are stored in a vector that must be reallocated and copied when even a single node is inserted. So, I was wondering if moving to a WPF treeview held any benefits in terms of performance with large datasets. You're quite correct .. you don't need (and may not want) two separate classes, just a boolean to indicate the policy. Josh Smith's implementation (referenced in my article) uses a flag passed in to the constructor to select lazy load. I haven't worked with WinForms, and I haven't tried such a large data set in WPF, but I wouldn't be surprised if it has trouble scaling up. The best source on this issue that I've found is Bea Stollnitz's blog - see this article. She describes some new features for UI virtualization in .Net 3.5 SP1 which may help, and also presents ideas about data virtualization. Thanks. The article looks interesting, and I'll have a look.